Dr. Arpit Bansal – MBBS, MS, FMAS, FCS Is one of the renowned & Advanced Laparoscopic & Onco Surgeon & Male Infertility consultant. 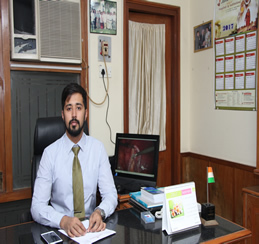 He is a leading specialist in male infertility in the state of Uttar Pradesh. He is Director of 500 bedded Multispeciality & Superspeciality Jeevan Jyoti Group of Hospitals, Allahabad. Dr. Arpit Bansal besides an eminent Laparoscopic & Onco Surgeon & Male Infertility specialist, who has held positions of Director, He is Consultant, Advisor and chairperson in many events and organizations. His credo is two fold: Self is the cause and self is the effect and no religion is as great as doing good to others. One needs to concern oneself with oneself performing one’s duties enthusiastically with a self identifying vision according to respective position in life for the universal good without concerning with the results. Keep working results follow is his Mantra. His belief is TQM-S-Total Quality Management of self. His mission is whole man who is physically enduring, emotionally mature, aesthetically developed, morally sound and spiritually inclined. His strategy is to transform the individual as effective role player to be useful to himself, to his family, to his organization, to his society, to his country, to the world his commitment is value addition to the individual personality of such persons who prefer to excel. He is a great catalyst to lead people to live life with dignity. In most of the hospital and clinics everywhere patients are welcomed with stickers that read "Doctors treat, God cures". Ashwani Kumar Bansal, Arpit Bansal, Vandana Bansal, Ajay Kumar. Identification of Hepatitis B Virus Pre-Core Mutant and Association with HBV Genotype by PCR- RFLP in Patients Suffering From Chronic Liver Disease, Uttar Pradesh: North India. Int J Health Sci Res. 2014;4(9):216-223. Ashwani Kumar Bansal, Arpit Bansal, Vandana Bansal, Ajay Kumar, Mamta Singh. Association of Oncogenic Viruses in Liver Cirrhosis: North India. Int J Health Sci Res. 2014;4(9):224-229. Ashwani Kumar Bansal, Arpit Bansal, Ajay Kumar. Clinical profile of scorpion sting from north Uttar Pradesh, India. Int J Med Sci Public Health 2015;4:134-137. Ashwani Kumar Bansal, Arpit Bansal, Vandana Bansal, Ajay Kumar. Liver abscess: catheter drainage v/s needle aspiration. Int Surg J. 2015 Feb;2(1):20-25. Ashwani Kumar Bansal, Vandana Bansal, Arpit Bansal, Ajay Kumar. Comparison between bipolar vessel sealer (LigaSure vessel sealer) and harmonic scalpel in total laparoscopic hysterectomy. Int J Reprod Contracept Obstet Gynecol. 2014 Dec;3(4):1006-1009. Ashwani Kumar Bansal, Arpit Bansal, Murtaza Akhtar A clinical study: prevalence and management of cholelithiasis. Int Surg J. 2014 Nov;1(3):134-139. Ashwani Kumar Bansal, Arpit Bansal, Murtaza Akhatar,. An Extended Analysis of Gall Stones: Nagpur, India. Indian Journal of Applied Research. Vol 5 (3): 445-448. Ashwani Kumar Bansal, Arpit Bansal, Vandana Bansal, Ajay Kumar Gallbladder Carcinoma: Clinical Profile and its Management. Indian Journal of Applied Research. 2015, Vol 5 (4): 857-861. Ashwani Kumar Bansal, Arpit Bansal, Vandana Bansal and Ajay Kumar. Risk factor associated with gallbladder malignancy in North India: a prospective study. International Journal of Innovation Sciences and Research. Vol.4 (2): 072-075. Ashwani Kumar Bansal, Vandana Bansal, Arpit Bansal and Ajay Kumar. Seropevalence of HBV in Pregnant Women and its Co-infection with HCV & HIV. Int. J. of Recent Scientific Research. 2015. Vol. 6 (4): 3590-3593. Ashwani Kumar Bansal, Vandana Bansal, Arpit Bansal, Efficacy of SEVISTA (Ormeloxifen) in treatment of mastalgia and fibrocystic breast disease. Int J Reprod Contracept Obstet Gynecol. 2015.Vol 4(4): 1057-1060. Ashwani Kumar Bansal, Vandana Bansal, Arpit Bansal, Effectiveness of L-arginine in Oligohydramnios on amniotic fluid index. World J of Pharmaceutical Research. 2015. Vol 4(8): 1354-1358. Ashwani Kumar Bansal, Arpit Bansal, Vandana Bansal and Ajay Kumar. Experience with splenic trauma in Jeevan Jyoti Hospital, Allahabad, U.P.,India. International Journal of Developmental Research.2015. Vol(5):5510-5513. SILISCON 2011, 1st International Conference & Live Operative Workshop on Single Incision Laparoscopic Surgery. 1st International conferences and live operative workshop on advantage laparoscopy and G-Ross, Pune. Training at Suture Practicum , Ethicon Institute of Surgical Education, Mumbai. Attended AMA ONCOCON-2011, 14th national conference of AMA. Attended CME & Live Operative workshop LAPAROTECH, Nagpur. Symbosis Institute of Health Sciences (SIHS) 2nd International Conference Robotic Surgery & Advanced Laparoscopy, Pune. Attended UP AMSCON-2012 & 15th AMACON-2012 Recent Advances in Medicine, Allahabad. Attended 1st National PG Symposium (Making of a Surgeon), Nagpur in Jan 2013. Attended 9th annual live surgery demonstration course “ ONCOSURG 2013”, Tata Memorial Centre, Mumbai. He participated in state level Annual Refresher course IMA CGP 2011. He participated in state level RSSDI-UPCON 2011. Research Society for the Study of Diabetes in India – May 2011. He has attended Endocrine Update-2011 as delegate on 14th August 2011. He attended 43rd Quarterly programme Diabetic Education forum Endocrine Society on Andropause on Sep-2011. He attended lecture on Andropause in Indian Menopause Society Allahabad Chapter on Sep-2011 at Allahabad. He attended AMA-ONCOCON 2011 14th National Conference of AMA and workshop on Management of Common Cancer Oct-2011. He attended Central Sector Medical Conference/CME-2012 attended on ‘Shock-Evaluation & Management’ organized at Composite Hospital, CRPF, Allahabad (U.P.) on April 2012. He attended IMA-CGP 2012 theme “Challenges in Reproductive Health” organized by AMA on May 2012. He attended UP AMSCON-2012 & 15th AMACON-2012 Recent Advances in Medicine 2012 September 2012 at AMA, Allahabad. He took active part in “AAROGYAM” UPNCON-2012 U.P. Nursing Home Association Conference from Oct 2012 at NCZCC Allahabad. He attended Practical Diabetes-2012 organized by Alumni Welfare Association, MLN Medical College, Allahabad on 2012 at Allahabad. He attended CME on Stem Cell Therapy organized by Alumni Welfare Association MLN Medical College on November 2013. He attended UPAPSICON-2014 (22nd Annual Conference of UP Chapter of Association of Plastic Surgeons of India) from January 2014 at MLN Medical College, Allahabad. He attended lecture at SPMIT, Allahabad August 2014 in faculty development program organized on Teaching Methodologies. He attended GASTROCON-2014 as delegate September 2014 at Allahabad. He attended UP AMASCON-2014 & 17th AMACON-2014 October 2014 at AMA, Allahabad. He attended UPDACON-2014 (Diabetes) on November 2014 at MLN Medical College, Allahabad. He attended live workshop and Nation level CME on Bariatric Surgery by Alumni Welfare Association of MLN Medical College Allahabad on November 2014. He attended IMA-CGP 2015 at Allahabad on 10th May 2015. He attended lecture on “Changing faces of cardiac surgery in 21st century” on August 2015 at AMA Allahabad. He attended Alumni Welfare Association MLN Medical College Allahabad on 11th October 2015 CME on Minimal Invasive Ano Rectal Surgeries. He attended 80th UPINACON-2015 & 18th AMACOM from 7th to 8th November 2015 AMA Allahabad. He attended ASICON-2015 Platinum Jubilee of ASI at Gurgaon from 16th to 20th December 2015. He attended MILAN-2015, 5th Batch Golden Jubilee & 30th Batch Silver Jubilee Alumni Welfare Association, MLN Medical College, Allahabad on 27th December 2015. Regular free health checkup camps are arranged by Jeevan Jyoti Charitable Trust including month long free camps in Ardha Khumbh & Maha Khumbh at Allahabad. He organized IUI workshop in Arpit Test Tube Baby Centre, Jeevan Jyoti Hospital, Allahabad on 24th August 2014. He organized Blood Donation Camp on 2nd September 2016 at Jeevan Jyoti Hospital, Allahabad. He organized World First Aid Day on 10th September 2016 at Jeevan Jyoti Hospital. Best Presenter Award for Associations of Surgeons of India, Nagpur Chapter for the year 2012. 1st Prize for Best Video “Pelvic Anatomy” - Live Surgery Workshop & International Conference on Gynaecological Endoscopy, Paul Hospital, Kochi, Oct 2016. A Passionate Bird Watcher and Photographer and won 1st Prize in HSBC Nagpur Bird Race 2012 held on 16th December 2012.